Lloyd RubberTite Floor Mats are the advanced solution for floor protection. The RubberTite design features an array of small cups that trap high volumes of mud, liquid, and debris while maintaining a low-profile design. Every RubberTite Floor Mat is custom-designed for edge-to-edge coverage on your floors. There are no tall lips or channels on Lloyd RubberTite floor mats - all dirt and spills are secured in their small cups. They stay in place thanks to tiny spikes on the underside that grab your carpets to prevent slipping and sliding. When they get dirty, simply hose them off and the filth will wash right out of the cups. Whatever kind of style and personality you want to bring to your interior, RubberTite Floor Mats by Lloyd Mats can do it. They come in a wide selection of colors to complement or accent your interior, from factory-style Black and Brown to blazing Pink and Yellow. 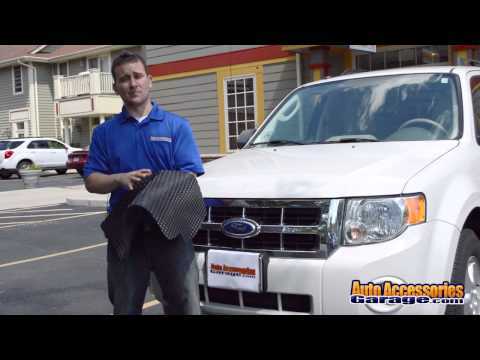 Plus, your Lloyd RubberTite Floor Mats are backed with a 3-Year Warranty. Wanted to write a review that answers the questions I had but had difficulty finding answers for, on this vehicle and those in the past. These mats are more rubber than plastic - I laid them on my garage floor just in case they needed to flatten - well they were instantly flat. Which is really great - I have the larger rear mat for my Explorer (third row down) rolled up behind the 3rd row seats, and I know if will be flat when I need it! That said, NONE of these mats have a lip - makes sense because they wouldn't roll up very well and that would make them much more expensive to manufacture and ship - they appear to be custom cut out of one large piece of mat, and are available in a lot of colors. The holes seem deep enough to capture a lot of water and mud, just be aware that the back larger mat may not go to every corner of the flat surface. Fine for me, but buyer beware. Came on time. Perfect fit and color. Very happy with this purchase and the company. The mats took seconds to fall into place. The design looks great in my Chevy cruise and the mats are of a extremely high quality and durable. The only reason i deducted from the performance and over all is I believe the mats need to be larger to cover ALL the carpet. These mats only lay on the flat portion of the floor boards and don’t cover the carpet sections going from the door plates and center console. It took longer to walk around my RV than it did to install. And it laid out flat very quickly even in the 15 degree temperature. I highly recommend and feel it should last as long as I have the van. Love them... also had them in my Buick LaCrosse. Took my car for service yesterday, and a couple of the mechanics commented on them and asked where I got them. Couldn’t wait to get my black fabric mats replaced with them as we’ve had a lot of bad weather. (salt on the roads, etc). Couldn’t be happier. Perfect fit for my 2018 Nissan Maxima! I ordered navy. Excellent quality and easy installation!!! Would recommend ☺️! I bought them for our the whole family's cars. I love them. Arrived super fast. Didn’t have to worry about airing them out - no smell or warming them up to fix the shape- no warping or curling edges. I was afraid they might look cheap but pleasantly surprised. Great quality and durable. Fair price. The mats look old but could stand to cover more of the floor. For the price paid, I wish they would cover more.